Ellen and I spend the weekend camping at MacKerricher State Park with our youngest daughter Caitlin and her husband Travis Williams. We took the Airstream and they did some tent camping next to the trailer. We had a great time cooking out and huddling around the campfire. No rain, but it was cold and a bid windy. It was slow posting as we had to use our cellphone connections. When we arrived at MacKerricher it was a opportunity to chat with the Rangers. One of our favorites day use parks on the coast is Russian Gulch, it has some great hiking trails and during stormy weather there is blowhole, that fills with sea foam, like a giant foam covered latte. California tax payers just spent a million dollars upgrading the water system in the park, that will not get much use as the park is on the closure list at the end of next summer. We walked on the beach and had a picnic at the Pacific Star Winery, one of our favorite haunts. The wines at the Pacific Star improve every year. It is a great place for whale watching, and this Saturday there was a wedding on the bluff over looking the ocean. After tasting we bought several bottles and dug into our cheese, french bread, fruit and salami. The only downer was the theft of our generator on Saturday night. We used our Yamaha EF1000 it to charge the trailer, cellphone and computer batteries. We called the Rangers and they came of file a report, and discovered that three generators and a wallet were stolen that night. In thirty years of National and State Park camping this was the first time we have has something stolen from a camp site. A change of times. I am not sure you can understand the impact of this claim of fraudulent journalism. Steinbeck's Travels with Charlie was the foundation of my desire to some day hit the road and RV across America. It was after reading Travels with Charlie, that I knew that this kind of foot loose travel was what I wanted to do some day. Why is Travels with Charlie a fraud? I will let Bill Steigerwald tell the story in On the Road with John Steinbeck who set out to retrace John Steinbeck’s 1960 trek across America and he discovered it was a fraud. If you’ve read my “Sorry, Charley” piece in the Post-Gazette or in the April issue of Reason magazine, you already know I’ve concluded that Steinbeck’s nonfiction book “Travels With Charley” is not just full of fiction; it's also a dishonest account of his iconic journey and what he really thought about America. Or, to put it less kindly, it is "something of a fraud" when it comes to telling the real story of his famous road trip around America. The research and drive-by journalism that led me to that conclusion is explained in gory detail on this blog, most of which I wrote on the road in the fall of 2010 while retracing Steinbeck's journey 50 years after he took it. I was a bachelor Air Force Officer living in Maine when I first read Travels with Charlie in 1961. I made an immediate connection with the story when Steinbeck started his journey in Maine. He inspired in me a desire to travel across the nation, from border to border, and this image has always been at the back of my mind, even after I was married and had a family. I met Ellen at Loring AFB and learned she shared my interested in camping and travel adventures. After we were married we build a camper into a naked Dodge Van and travel across the county for 30 days, when we left Loring AFB for our next assignment at Castle AFB in California. Our trip took us from Maine to the Gulf Coast and Louisiana, the reverse direction of Travels with Charlie, and then on to California over more of the same reverse route taken by Steinbeck. We were joined by our nine month old daughter Jessica, who I must admit took a lot of attention. Attention we might have payed to recreating some Travels with Charlie experiences. However, Steinbeck’s story did saved the day for me years later. Steinbeck described problems with some white threads that appeared in over stressed tires on his truck in Oregon. The tires on his truck were not rated to carry the load of a heavy camper shell. We were on a family camping trip across the country pulling a tent trailer, with a trunk full of camping gear, when white threads appeared on the tires of our Volvo. When I saw those white threads on the tires, I remember Steinbeck’s recount, and had our tires changed at a local shop some where in New Mexico. Our goal for the day has been Lubbock Texas, but our need for tires caused a delay and we stayed overnight at Cannon AFB. That night a tornado destroyed a good portion of Lubbock Texas, including the camp ground where we planned to stay the night. Charlie was a puddle. Today we have a standard poodle named Harper. When it came time to have another dog, our daughter Caitlin was promoting a poodle, and one of her arguments was Charlie was a poodle. I was not so sure, but now that we have Harper, I can understand the relationship between Steinbeck and Charlie. Poodles are the most intelligent and loving dogs that can take over your life through their loving nature and the attention they demand. While Travels with Charlie maybe an intellectual fraud, it was a inspiration for thousands of hours of camping adventures all across this great nation for the Steele family. I really do not want to know Steigerwald details, as Ellen and I have our own RVing memories and more Travels with Harper to look forward to. Ellen I have been visiting the Hat Creek Radio Observatory since the mid-1980s, after I read about the observatory in an amateur radio astronomy news letter. In the1980s and early 90s I was very interested in amateur radio astronomy, and I traded some equipment with one of the observatory staff. But, that is another story. The Observatory was founded in the late 1950s by the Radio Astronomy Laboratory of the University of California, Berkeley. An 85-foot antenna was installed in 1962 and operated until 1993, when it collapsed during a wind storm. The earliest experiments in millimeter-wave astronomy were performed at this site starting in the 1970s when a 2-element interferometer was constructed. From 1980-1985 a 3-element interferometer was constructed, with another four antennas added between 1990-1992. It was thrilling to standing among the array when the antennas moved in unison as they shift to a new observation point. After the 85-foot dish was lost, another three antennas were added to the millimeter array for a total of ten elements. This expansion was in collaboration with the Universities of California, Illinois, and Maryland and the observatory was re-named the BIMA telescope. The BIMA telescope array was moved to Cedar Flat near the Owens Valley Observatory in the spring of 2005 to be combined with other millimeter antennas as part of the Combined Array for Research in Millimeter-wave Astronomy project and to make way for the Allen Telescope Array (ATA). Who will be first in line? Ellen and I are on a short trip. As we approached an intersection in a small coastal town, the stop light turned red. While waiting for the light to change, we notice a group of about ten people waving signs demanding reform of our current medial system. They were all supporting Obamacare's single payer system, and damming the insurance companies with their signs. They all looked like well aged hippies, graying hair, dressed in the latest hand me downs from the thrift store. Then it occurred to us, they were all first in line candidates for Obamacare's the end of life counseling. What were they thinking? Picture of our campsite with the family relaxing around the campfire. Sorry the picture is a bit blurry, I forgot not turn on the flash and it was dusk. The GMC 2500 WiFi hotspot is rather slow, we must be on the edge of the Verizon broadband coverage. Since we arrived back in Nevada County on the 16th of July we have been preparing for our next trip, the Annual Family Camping trip to Lake Tahoe. For years we went camping almost every summer when our four girls were growing up. When they went off to college we included the boy friends in our camp outings. About six years ago, during a family get together, the girls expressed a desire to return to family camping, and proposed an annual return to Sugar Pine Point, where we had a wonderful experience in the late 90s. We did not go to Sugar Pin Point last year, due to Caitlin and Travis June wedding in Mendocino, so everyone is anticipating this return trip to Lake Tahoe. When we left on our cross county jaunt there were some strongly worded suggestions that we better return in time for the family camping trip to Sugar Pine Point at the end of July. We have been busy preparing: cleaning the trailer, repairing the furnace. rehanging an exterior door that was about to fall off, building some more retractable shelves and doing general fix up. Today we load the canoe, stock the refrigerator, and make our final clothing adjustments to match the weather, and fuel up the GMC and make the final adjustments for our family camping trip on Thursday. Our trailer will be the anchor for several tent camp sites, and will be big attractor for the four grandkids, thus Grandma had to rig for kids on board. Since Sugar Pine Point is a dry camp, with no power, water or sewer we also had to do some reconfiguring, cooler chest, making sure the generator was loaded with extra gas, and there is lots of firewood on board the GMC, plus some extra guest chairs, plus our bikes. More stuff than we had on the cross country trip. While all this was going on, we made multiple trips to Roseville for family birthday celebrations. Way too many July birthdays, Christmas in July, Ellen's mom called it. With each birthday party the excitement grew more intense. We now have a complete hiking/biking/canoe schedule, with meals assigned and menus planned. Grandpa is looking forward to sitting under a tree and reading, and maybe doing a little blogging if the GMC-2500 hotspot is working, while baby sitting a daughters new puppy. I will try to take some pictures to share. We arrived in Truckee last night and the smoke was not as bad as our imagination. I have a Transportation Commission Meeting this morning in Truckee. Without this scheduled commitment, we might still be on the road for another week or so. But, both Ellen and I are looking forward to coming home to a much larger house and our much larger bed room. Trailer living is fun but it gets rather close after three months. We want to be come acquainted with all those things we had to leave behind when packing the trailer. Plus there are some things that need to be fixed before our next trailer trip the last week of July, when the family gathers for the annual family camping trip at Lake Tahoe. I will have a trip recap in a couple of weeks, but first I have some client projects to get cleaned up. Stay tuned. Tax'em until they fall asleep. We have stopped for the day in Elko Nevada at the Iron Horse RV Resort. We have been on the road for three months and have been staying in RV Parks and Resort along the way. The prices for a piece of dirt, grass or concrete with power, water, and some times a sewer connection ranged from $20.70 to $57.00 for a one night stay. Tonight we are sleeping in our own bed again, but we will be paying the City of Elko and surrounding County $5.40 in bed taxes. 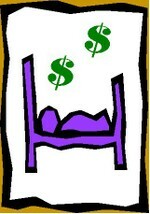 This is the first time in three months we had to pay a bed tax to sleep in our own bed. I am thinking this taxing thing has gone way too far, especially when you have to pay a tax to stay in your own bed. Now that Belgium-based InBev has bought Anheuser-Busch over the weekend, will all the new Bud labels read "Product of the EU?" When we were in Canada and shopping for wine, many of the labels read "Product of the EU." This makes shopping for an Italian wine, or a Spanish wine, or a wine from Germany just a tad difficult. I would find it very troubling that a beer so uniquely American could be labeled a product of the European Union. On the other hand, my new son-in-law who hails from Canada recently introduce me to Stella Artois which is brewed by InBev. I like it better than most of the bland Buds produced by Anheuser-Busch. Maybe I am more ready for a One World Beer than I thought. On the other hand, given the growing number of micro-brew labels that are cropping up across the country, I am sure we will have many unique choices with US labels. When traveling, and want a beer with lunch or dinner, we ask for the local micro brew. Most are very good and once in a while you run across one that is outstanding. One of the joys of travel it being exposed to some really great beers. Oregon has some classics and if the air does not clear in Nevada County real soon now, we may be sampling some of Oregon's finest sooner rather than latter. There are some advantages to pulling a trailer, when the air gets bad, just move to a place with better air.